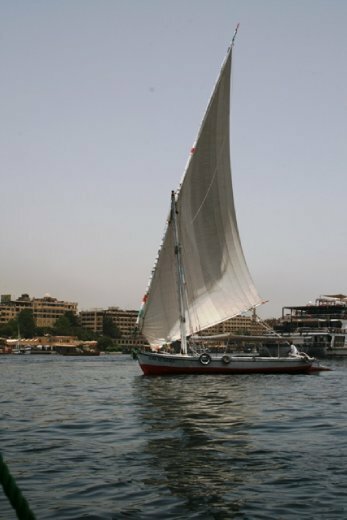 After a late start we caught our felucca for the next stage of our adventure. This single triangular sail flat decked boat was to be our home & transport for the next two days. We were pleasantly surprised to see how large it was, with soft mattress flooring and a canvas roof covering our living/sleeping area. On boarding Sam presented us with some local Egyptian sweets, one of which reminded me of koeksisters, a South African treat. After a couple of hours of tacking downstream against the freshening wind and narrowly avoiding the massive Nile cruise ships on the way, we stopped at a site near the tombs for a swim and late lunch. The American girls still didn’t want to brave the river water, but we were all too hot to say no a dip in the surprisingly cool water, though once again Shaun was the only one brave or foolish enough to put his head under water. It was strange swimming with an armed guard sitting in a little house on the bank watching us, especially since there didn’t seem to be anything there worth guarding. Lunch was great – a mix of local breads, white cheese, tjajeen, and of course, followed up with watermelon. I was sticking to my plan and had a couple more pieces. So far so good. After lunch we sailed for about 3 hours until we reached the village where we would be spending the night at a homestay. Our captain led us to his family’s house through the small dusty settlement on the edge of the Nile. A large wooden door in a light and dark blue patterned high wall opened into a central yard filled with freshly swept sand and lined by paths with doors leading into various rooms. The far wall had four open dome-shaped doors leading into a large, freshly painted room with several mattresses made up on the floor mat and fans whirring busily overhead while an air-conditioner chugged laboriously at the back of the room. Mosquito nets hung over the mattresses like pink and blue floating candy-floss, but these were soon taken down as the moving air kept any out-of-season mosquitoes. We were met by his wife and two teenage daughters. His eldest daughter at 16 years old spoke English well as her mother was an English teacher, and she took us for a “short tour” of the village, where we ended up hiking up another sand-dune (oh my aching legs!) for a beautiful view of the village and Nile. Two of the countless little kids followed us, their little legs working like pistons as they trailed up the hill to grab our hands and “lead” us through the village. His daughter explained how large squares of blocks (which I’d thought were wells or tombs) were scattered over the area to mark which land was private so that the government couldn’t move in – their version of fences and a “keep out” sign. We arrived in time for another amazing home-cooked meal, and were invited to a traditional Nubian wedding later that night. Much, much later, as the celebrations only began at midnight and ended at 6am! The bride and groom had already completed the ceremonial jumping over the cow’s blood at 5am that morning, and all that was left was the party. We killed time by playing some hilarious games with the girls – all versions of drinking games I know from Uni. It’s funny how some things are universal, and can be enjoyed without the need for much conversation! The Indian-style music was endless, as in the songs literally did not end and would last for 30 minutes or more, which is fine if you enjoy the music, but gets old fast when it sounds like nails down a chalkboard. We’d been dragged out into the light to sit on a mat by the wall, where all the men stared at the intrusive Westerners with out uncovered heads – we had asked if we should cover our hair and were told not to worry about it, but I soon wished that I had. It became a little less awkward when a couple of the homestay girls joined us and could tell us what was happening (which was not a lot). Eventually the bride arrived in a car and was surrounded by her brightly dressed entourage as she attempted to settle her blue meringue style dress on a chair. After about half an hour the groom noticed her arrival and took her to the dance-floor where she joined the side-stepping crew. The women then all stood up and moved forward to watch the dancing, but none of them joined in. By this time it was 2am and, as there didn’t look like there was much else happening, we decided to call it a night. I think food was to be brought out later but we were too tired to stick around much longer. I’m glad that I went, but I can’t say that I will be going to another Nubian wedding anytime soon!